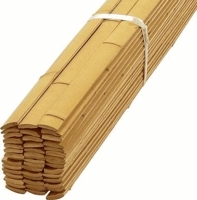 Buy Cheap Thatch Cheap and Cheap Bamboo Products on this Page! Looking for Cheap Bamboo? Looking for Cheap Thatch? All the Thatch and Bamboo products listed on this page are Cheap and Significantly Discounted. These are NEW BLEMS with imperfections and will have damage to them but are usable. Some products have been repaired and have flaws that are Sold As Is, no returns. The Thatch has holes but can be repaired. We will supply twine to do that. The Cheap Bamboo Umbrella will have thin spots or crooked poles. Sorry we don't have pictures of the damage but for the great price you will be Happy. Sorry No Returns. Please call prior to purchasing if you have any questions about our thatched umbrellas sale. 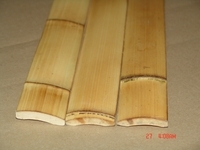 We regularly update this page for Cheap Thatch and Cheap Bamboo Products. So be sure to come back and check it out! 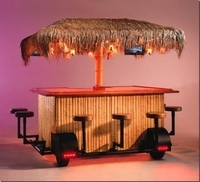 If the below is not what you are after then check out Tiki Shack Importer's Featured Products. 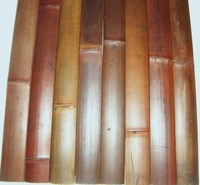 Please note that all colored bamboo slats can have many color variations in them due to the dying process, some can have a shinny gloss to them. Example Mahogany will have reds, light browns, dark browns, burgundy etc. Smoked will be light or dark in colors. Black will be light or dark and will have a shinny gloss. There is no way to control this. Please consider before buying. Bamboo is non returnable. Also the products are in limited supply on this page, make sure to order enough the first time because we may be out of stock or have a different color available if you have to reorder. Check Out our Cheap Thatch and Cheap Bamboo Products Below! Easy Ordering Online. Just Place your Order BELOW. Alternatively, to request friendly customer service, call (909) 370-2700 or toll free at (866) 944-TIKI (8454). → We will BEAT Any Price Guaranteed! Are you thinking of redecorating your lawn or adding exciting, new d�cor to your yard, garden or pool area but the budget is a little tight for your grandiose ideas on what the end results should be? Maybe you have some innovating ideas for the inside of your home to give it a more personal touch, or maybe a touch of the mysterious or exotic. If you want everything stylish, serviceable, long lasting, eco-friendly and color coordinated to fit your surroundings with a natural look that flows with the environment, look no further than cheap thatch and bamboo. Buying cheap thatch and bamboo does not mean buying inferior materials. Many items are new but have been slightly damaged and then repaired, they may be discontinued items or are on sale or clearance items. 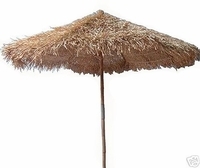 Some examples being a thatch umbrella or bamboo umbrella with bent poles or thin spots or a tiki thatch roll with holes that are repairable with the twine included with the order. Free shipping is usually included as well as friendly, reliable customer service. Look for a reliable, established company with a proven track record and good customer reviews; people like you that are looking for affordable options and are happy with the service the company has provided. Few materials are cheaper or easier to work with than palm thatch, it is durable and an excellent insulating media for a thatch umbrella or the thatch roof of your tiki bar. Thatch is made of palm or grass, cut and dried then woven into practical uses which are sustainable and cost effective. It comes in different styles; palm thatch, synthetic palm thatch, or palapa thatch and is used on various types and styles of buildings to give the island feel of a tropical escape. It is used for its sustainability, durability and aesthetic appeal. It provides shade and insulation to your project, allowing hot air to flow upward, relieving heat and humidity in warm seasons and insulating to help regulate air temperature during different seasons. Tightly woven leaves and the correct design keep it a waterproof covering during rainy weather, providing you with a warm, dry spot to enjoy the different seasons. Look for your best deals on strong, versatile varieties of thatch for your designing needs by going online and finding the best offers featuring quality materials with free shipping and fast delivery. When considering using a thatch roof to cover your backyard retreat; be it a tiki bar roof, thatch hut roof, or covering to dress up an existing roof, you need to look at the different styles of thatch to best compliment your design. The three main styles to choose from, each with their own unique look and design, are: The Palm Island Thatch, the Tahitian Thatch and the African Reed Thatch option. Made from Mexican Palm leaves, the Palm Island thatch tends to be more laid back with a slightly shaggy effect to give it its unique appearance. It is made by taking matured natural palm leaves, tested for strength and durability; then curing them after cutting them into strips. Tahitian thatch is made from the leaves of the coco palm tree and is also referred to as elephant grass or Fiji thatch. With its rustic, chunky feel, it adds dimension to your structure and is 98% waterproof. While it has a wide range of applications, both indoor and out, it is used primarily for roofing projects such as tiki bars, cabanas and used for covering umbrellas. A highly durable option is African Reed thatch, made solely out of cape reed. With excellent insulation properties, rot and mildew resistant and wind resistant, this is a fine product for your landscaping needs. It is a naturally sturdy, flat laying thatch which produces a very uniform and orderly appearance. Bamboo is another product that is economical and durable for your building projects and can be found cheaper with a few flaws and blemishes that do not affect their effectiveness or beauty when using them. Bamboo is the fastest growing plant on earth and a sustainable building material, growing continuously after harvest with no need to re-plant. It could easily be a substitute for wood projects such as particle board, fiber board, flooring, molding, lumber and poles without having to cut down entire groves or plantations! Bamboo contributes to a cleaner, greener environment, converting about 35% more CO2 into oxygen than a regular tree. As a versatile building project, it is hard to beat bamboo for cost, beauty and diversity of uses. It is used for indoor projects such as room dividers, floors, stylish window coverings, furniture, stairwell banisters and as many different projects as your imagination can create. Outdoors the options are innumerable, including bamboo umbrellas, bamboo tiki bars, backyard tiki huts, fencing, build your own tiki torches, pool privacy sections and the look of an island paradise. 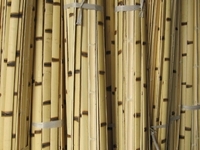 Shopping online for bamboo poles, sticks and canes, you will be afforded opportunities to buy wholesale, bulk, discounted or minor flawed materials with fast, free delivery. Look for great options online and have the products delivered directly to your door. Wholesale items, discontinued items or items with slight imperfections are available, along with information on how to measure and calculate the amount of materials you will need to complete your project.